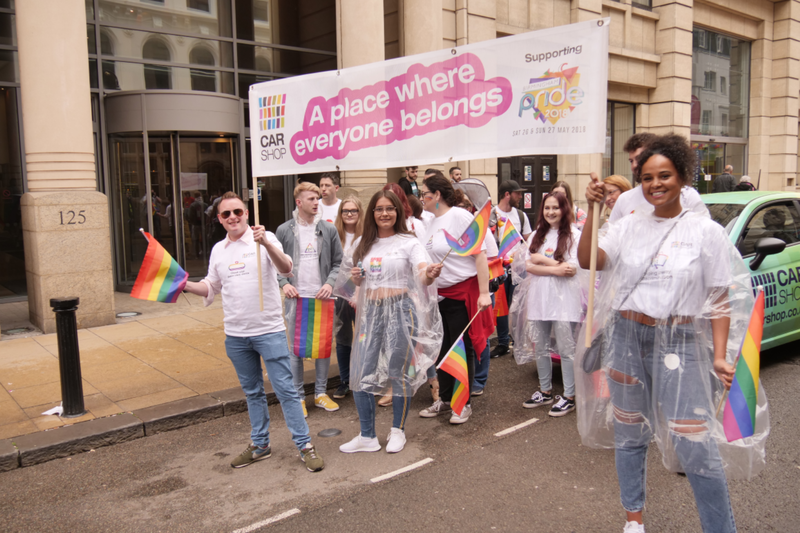 Colleagues from the Cardiff store of the award-winning car retailer quickly offered up their spare time to take part in Birmingham Pride. 20 people across the business signed up almost immediately, and with their guests invited too, they made up a cavalry of 32 in the parade. Fiona Cottle, People Director said: “By encouraging colleagues to live our Values and Behaviours, we are driving a more open, transparent and inclusive culture where determination, trustworthiness, and collaboration are encouraged and celebrated.” The real sense of belonging is clear after seeing the amount of people willing to take part in Pride and embracing everything it stands for. All of the marchers proudly wore custom-made t-shirts designed in-house. 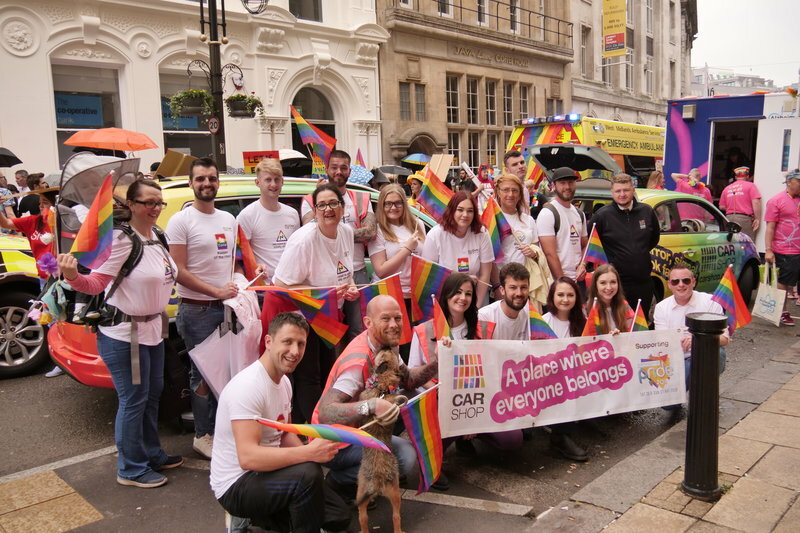 They showed phrases underneath road signs and other motoring themed imagery including “driving diversity” “shifting stereotypes” and “mirror, signal and be fabulous.” These phrases were all fully supported by the organisers of Pride. And since they were representing CarShop, there was no float to be seen – but two amazingly vibrant vehicles straight from their stock list. 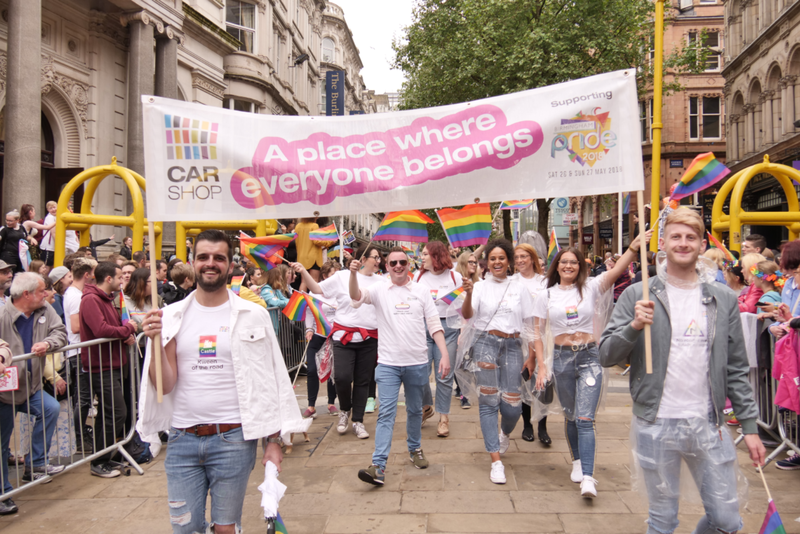 The Fiat 500 and Volkwagen Tiguan among the marchers each had a wrap designed in-house and combined all the elements of the LGBT Pride flag as well as the vibrant CarShop logo. This really made the CarShop team stand out from the crowd. The parade was the biggest one to date, with 130 groups this year (compared to 105 in 2017), 4,000 people and 40 vehicles. The 45-minute parade started from Victoria Square at 12pm and travelled through the streets of Birmingham to the to the main festival area – Hippodrome Plaza. Ben Scholes, Content and Communications Manager said: “We’ve had such a good day at Pride. The atmosphere and the people have been fantastic, and it’s really great that we’ve been able to support our colleagues and communities this way. The Pride parade was only the latest endeavour to be actively involved in communities. As part of the effort to be present in the wider store area and get to know their customers, CarShop have been involved in community projects for over a year now after teaming up with national charity Global’s Make Some Noise. This meant they could support lesser-known projects local to store areas. This is just part of the CarShop Cares programme and was driven by colleagues in its entirety.